When someone breaks your heart, it makes time stop, almost literally - until you realise you have to move on, and that there’s more to life than just waiting. 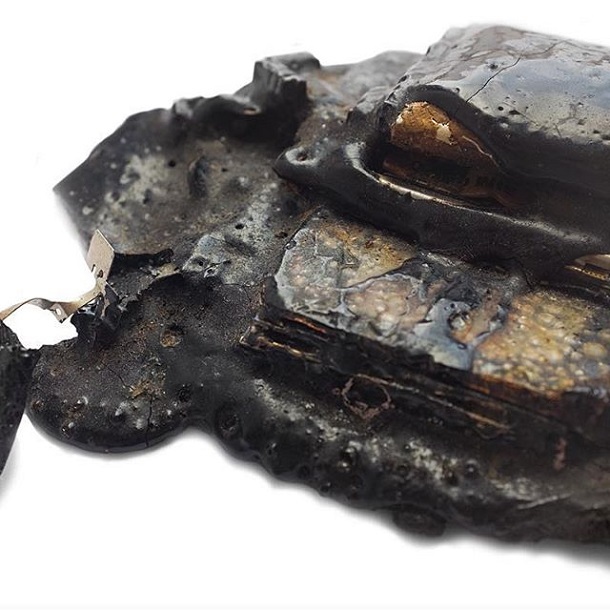 While there’s nothing than can ease the pain you feel, two people in Croatia recognize that hurt is more common than any other feeling in the world and that went on to become the foundation for The Museum of Broken Relationships. Conceptualized by Olinka and Drazen in Zagreb, Croatia, this museum is dedicated to displaying love in its more recognised form: the bringer of pain. 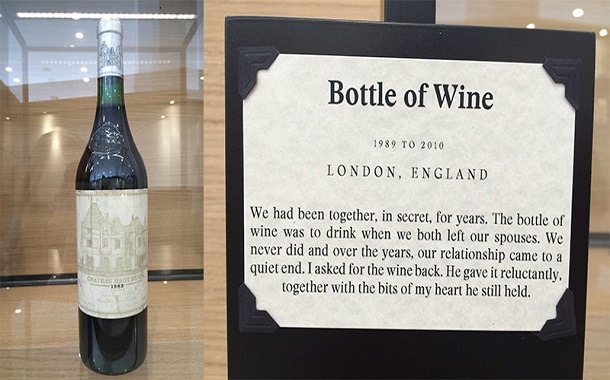 What started off as a joke among two people who had just ended their relationship, went on to become an award winning museum. It began as a travelling collection of donated items from people around the world. Here are a few donated items that are on display in LA, along with their stories of broken hearts. 1. 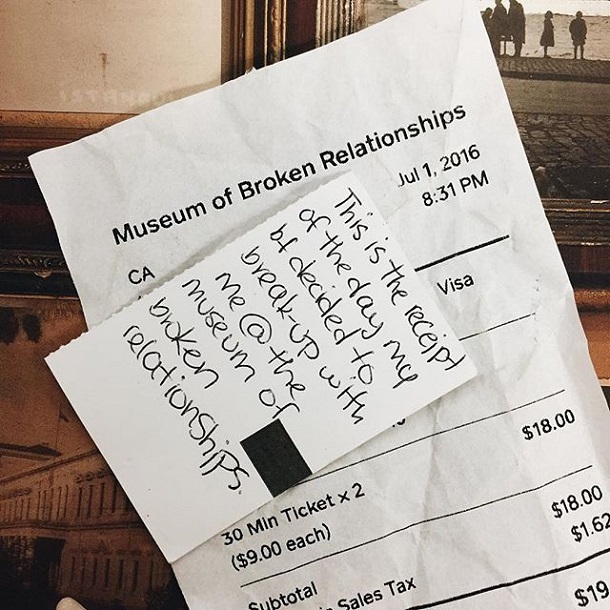 When the museum of broken relationships became the venue for a broken heart. Some say that the stories which have a happy ending; haven't ended yet. 2. Some stories are brutally cut short by time. My husband died of cancer, so our love still goes on in me. 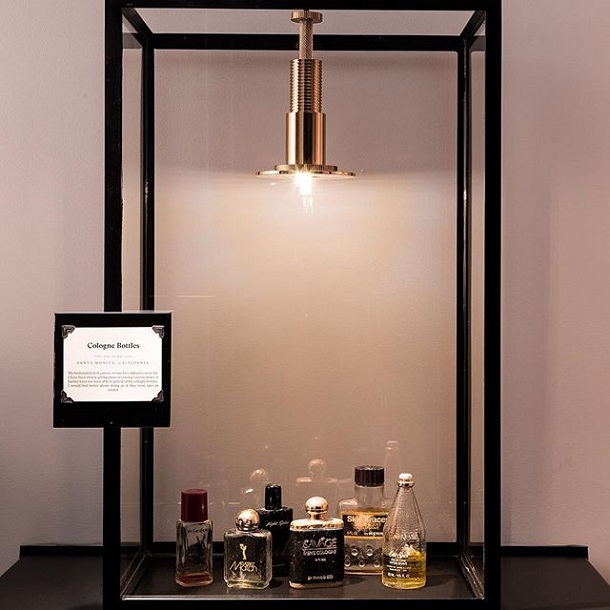 I have been slowly giving away or tossing various items of his but have not been able to give away any of his cologne bottles. If they would be exhibited, that would make me feel good. 3. If I got locked away, and we lost it all today; tell me honestly - would you still love me the same? After five years of marriage, out of the seven we were together - my husband told me that he felt stuck and that he "probably" didn't love me anymore. 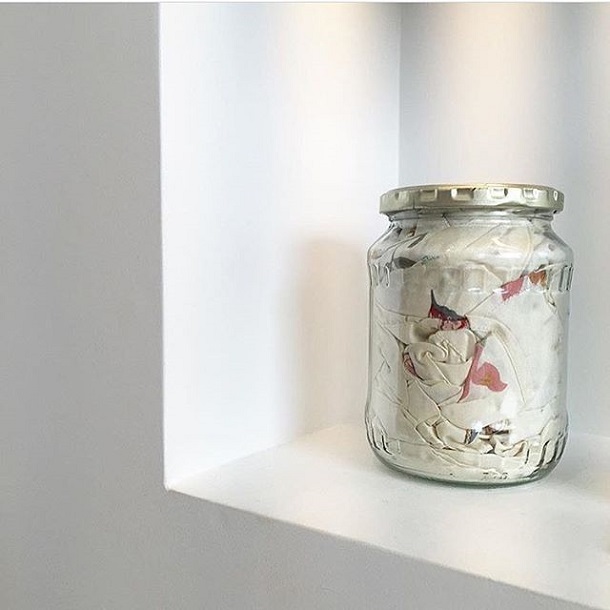 So, I stuffed my wedding dress in a pickle jar, due to lack of space and simply because I didn't want to see it anymore! On my boyfriend's 27th birthday, I started writing daily little notes for him, so that on his 28th birthday I could give him a mason jar with 365 tiny letters. I managed to write 103 notes. I stopped on the day when he broke up with me. Cleaning up the apartment after the once-in-love couple left, I found this flip phone in the oven. I think one of them put it there to anger the other. 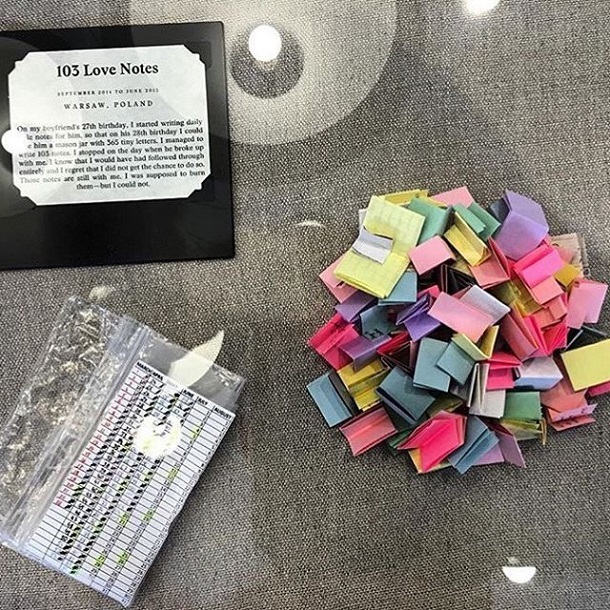 The above pictures and stories are 100% genuine and are real exhibits at The Museum of Broken Relationships, LA. A quickly booked air ticket should get you there in order to confirm the authencity of the same! Do write to us, about the other exhibits that caught your eye!